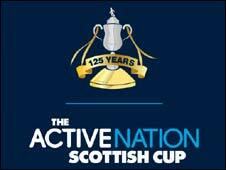 Stirling Albion reached the fourth round of the Scottish Cup after edging past junior side Auchinleck Talbot. David O'Brien's enterprising run and cross created the chance for Liam Corr to head home the opener for Stirling after 10 minutes. But the visitors levelled in the 35th minute through Sean McIlroy's penalty, which was awarded after a handball by Ross Forsyth. But Forsyth made amends on 64 minutes by heading home O'Brien's corner. Stirling: Christie, Feaks, Forsyth, Graham, Robertson, McCord (Murphy 56), Gibson, Corr, Prunty (Mullen 65), McKenna (Grehan 65), O'Brien. Subs Not Used: Taggart, Hogarth. Goals: Corr 10, Forsyth 64. Auchinleck Talbot: Strain, Robb, McVey, Pettergrew, Gavin Collins, White, Young, Slavin, McIlroy, Boyle (Gillies 34), Latta (McKelvie 83). Subs Not Used: Carson, Gary Phillips, MacIntosh. Booked: Latta, White, Gavin Collins, Pettergrew.